Shawanda first came to The Arc in August, 2012. She had previously been employed with Kiva, an Assisted Living Facility in Palatka. Hired by Latonia Hightower at the River Street Group Home, she soon distinguished herself with a “can do” attitude, a sense of caring and respect for the residents she serves, and a polite professionalism. Latonia points out that she’s always willing to work any shift, stay late when asked, and has had a perfect attendance record. She’s also always trying to learn new things as exemplified by her interest in taking a bigger role with her residents’ medical care. And she’s assumed a role in mentoring new staff and helping them get to know the residents and their needs. But the quality that stands out above all others is the way she puts her residents first. Whether it’s introducing new food items at meal time, coming in off vacation to make sure a resident is properly dressed for a formal event, or taking residents to church with her on her spare time, Shawanda’s dedication to her work and the people she serves is always evident. 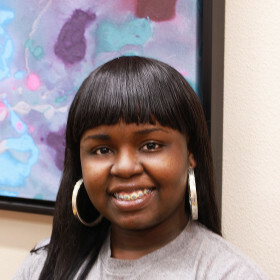 Thanks, Shawanda, for all you do to make a difference in our resident’s lives.